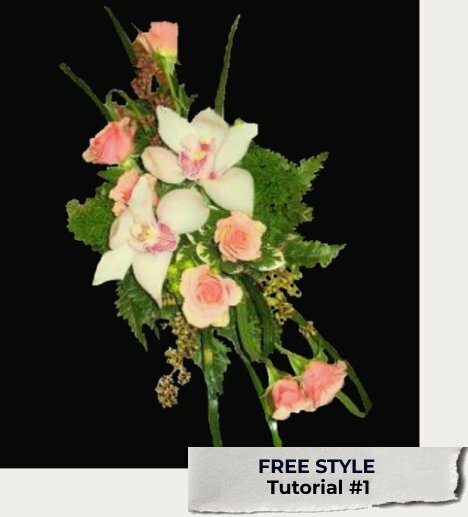 These wedding bouquet styles don't usually fit into a standard shape like cascades, round, pomanders, spiral hand tied, teardrop and tight hand tied bouquets. They have more of an open, free flowing style within their design. Basic design techniques still apply, but you aren't constrained by a specific shape. These used to be referred to as "modern bouquets", which simply meant they were a little more original and a bit out of the ordinary. What is your favorite look - big and flowing or small and dainty? Do you want to match your bridesmaid dresses or compliment them? What do you want in your bouquet to make it stand out from your attendant bouquets? Do you want a bouquet to have a strong scent or none at all? Does your dress have in intricate bodice? Is the ceremony going to be inside (in air conditioning) or outside (hot weather)? Are you having an outdoor photography shoot? Typically brides don't always have a specific bouquet style in mind - yet they are probably already leaning towards colors. You need to explain that flowers don't always come in specific "crayon box" colors. A "pink" flower in different flower varieties can be completely different, so choosing "baby pink" doesn't always refer to unified color scheme. Urge your brides to give you color samples and encourage them to compliment their color scheme rather than try to "match" the colors exactly. This may lead to more disappointment, as flowers are a living growing organism that doesn't always bloom in the exact shades of bridesmaid dresses. I can always tell when brides told the florist they want "blue" flowers, and are surprised to find violet-red flowers in their bouquets. Ask for photos of each flower you are thinking about, as classified "blues" can run from a deep dark purple to a bright red-violet and STILL be classified by flower farms as being a "blue" flower. Always instruct the bride on how to carry the wedding flowers. Many times nerves make them or the bridesmaids clutch the bouquets up too high, covering up intricate beading details on the bodice that made them fall in love with the dress.